Looking for a stainless steel pallet jack, galvanized pallet jack or a zinc plated pallet jack to use in your clean application or wash down environment? HOF Equipment Company has got you covered! Stainless steel pallet trucks are often a requirement for clean rooms, food production centers, and in medical / pharmaceutical applications. 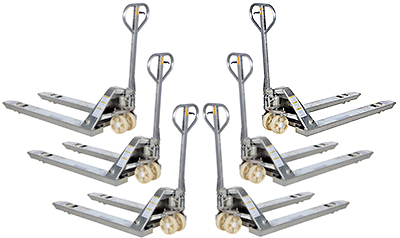 We also supply partial stainless steel pallet jacks which provide good cleanliness and rust resilience at a lower cost. 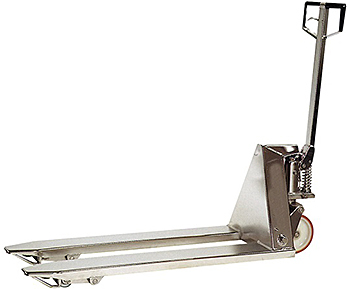 A stainless steel pallet jack with scale (also stocked) is a handy way to transport and weight pallet loads simultaneously. Our goal is to a help our customers find excellent solutions. Detailed product specifications are provided on our website or you may call and speak with a HOF Equipment sales representative anytime!